I feel dumb… and embarrassed… and ashamed. I made the oldest baking mistake in the Betty Crocker cookbook. The recipe called for 4 ½ tsp of baking powder. I used 4 ½ tsp of baking soda. But let’s back track a little…. My work was having a holiday bake sale last week and I wanted to contribute a few items. 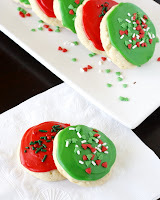 I decided to try out this sugar cookie recipe that Grace had pinned from What Megan’s Making. ﻿I got out of work early, ran to the grocery store, and got to baking. I made the sugar cookie dough, let it chill and baked them up. I decided to try one and give one to my roommate to “quality control.” We’re standing there in the kitchen, chewing away and all of a sudden, we both get a look of disgust on our face and grab some water. They were awful! They had a bitter after taste that just wouldn’t go away. And then it dawned on me what I had done. Thank goodness we had tried them before I sold them at work! The weird thing is, that the uncooked dough tasted delicious! I guess chemistry is not my strong suit. Beat together the butter & sugar. Beat in eggs one at a time then add vanilla. Mix in dry ingredients. Cover and chill for an hour. Scoop a quarter cup amount and roll into a ball and flatten slightly. Bake at 350 for 10-12 minutes. Allow to cool and frost. I ran out of confectioner’s sugar so I had to just use the store bought frosting. The Verdict: I don’t really like sugar cookies that much but these were really good. I liked how they were a bit puffier then a normal sugar cookie. They sold out at the bake sale so that’s always a good sign. Things to Note/Consider: read the directions carefully! Since these were going to a bake sale, I bagged three together to make it easier to sell. Unfortunately I didn’t have red or green ribbon but I still think they are cute.